Better Name : Dair au Blan? Who do wewe think has the biggest heart? Do wewe like Blair with Chuck? Do wewe like Dan with Vanessa? How would wewe feel if they actually got together? mashabiki wanachagua: I'd be soo happyyyy..
what is your inayopendelewa season 5 scene? This must be how David felt after the dentist. It feels too freaking good to be real. I remember watching awali seasons of the onyesha with wistful sighs whenever Dan and Blair interacted, because I truly thought they didn’t have a chance. The Chair fanbase was too vocal for the writers to take a risk like that, right? Well, I’ve never been so glad to be wrong in my life. Tonight’s episode zaidi than made up for all those times I felt I was hoping for the impossible. If wewe have not seen the Bones Season 6 finale STOP kusoma NOW!!! a comment was made to the poll: Chair au Dair? 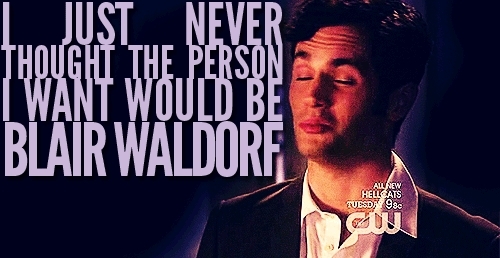 a comment was made to the poll: Do wewe like the Idea of a Dan/Blair/Chuck upendo triangle? a comment was made to the poll: do wewe prefer them to dan & serena? a comment was made to the poll: which season would wewe have preferred them to get together? a comment was made to the poll: Do wewe like Dan and Serena au Chuck and Blair?